In the beginning of 17th century the aristocratic Boyle family bought an estate in Chiswick with a large Jacobean house, as a summer retreat. It caught fire in 1725, and the head of the family, Richard Boyle, 3rd Earl of Burlington, decided to build a new ‘villa’ in the grounds. As the name suggests, it was not to be an ordinary English house. It was to be a Roman Villa – a masterpiece of classical architecture, coming to England all the way from Italy’s lost Roman buildings. Richard inherited his title and riches at the age of 10, and, like many of his contemporaries, devoted himself to arts, going on Grand Tour of Europe in 1714 – 1719, and another one later on. The new villa was to house his collection of paintings and furniture, which he brought back from his travels. Lord Burlington regarded himself as an architect, and designed the house himself, based on his experiences in Italy and a substantial collection of books and drawings acquired there. Also in Italy he met his sidekick, a person who was to change the English garden design forever – William Kent. Kent studied in Rome in the beginning of the 18th century. Having met Lord Burlington on his travels there, he secured a commission to work on the design of the house and gardens at his estate in Chiswick. Chiswick House is a fine example of the Palladian Style – Lord Burlington was inspired by the recently published English translation of The Four Books of Architecture by the 16th century Italian architect Andrea Palladio. In contrast to typical English Gothic style, this was all about classically proportioned geometric shapes and clear lines. The Dome, crowning Chiswick House, is a rare feature of domestic architecture, normally reserved for temples. The house is faced with Portland Stone, glowing brilliantly white in the sun. The house was built between 1726 and 1729. Innovative and beautiful as it was, it was the gardens that made history. The formal Jacobean gardens of the Chiswick estate were replaced by the new ‘landscape’ style, as designed by William Kent. Being a painter and theatre set designer, Kent’s vision for the garden was derived from landscape paintings of the French artists Nicole Poussin and Claude Lorraine. It was all about the garden looking naturally beautiful, but every feature – either growing or man-made – carefully planned and in the right place, to achieve the most pleasing effect. The gardens included alleys shaded by trees, Ancient Greek statues, a lake and a cascade, as well as an obelisk and garden buildings, to evoke the appearance of Ancient Rome, combined with Lord Burlington’s Whig ideals. The Ionic Temple survives from Lord Burlington’s times. It takes inspiration from either Pantheon in Rome, or the Temple of Romulus. Both Lord Burlington and William Kent were keen on theatre, and theatrical design is reflected in a semi-circular hedge, known as the Exedra. The actors are the Roman statues. Kent’s originals were ‘identified’ by the writer Daniel Defoe as Ceasar (the one who invaded Britain), Pompey (responsible for the decline of the Roman Republic) and the philosopher Cicero. The Exedra also featured poets Horace, Homer and Virgil, and the philosopher Socrates. The current ones are reproductions – the originals are inside the house. The lake was created in 1727 by widening an existing brook. Kent’s Cascade – the two level waterfall – graces the end of it which is closest to the garden. The hill was made by piling the soil from the lake, and this created an elevated walkway above the cascade, affording views of the estate and the nearby River Thames. We climbed it, but could not see anything due to trees and hedges…..
She loved Chiswick House and referred to it as her ‘earthly paradise’. The house was extended to provide accommodation for prominent members of the Whig party, aristocrats, writers and artists partying in the house and gardens. Georgiana commissioned architect James Wyatt to design the Classical Bridge in 1774. The family added new wings, so that they could entertain a multitude of important guests, who, over the subsequent years, included a couple of Russian Tsars, Queen Victoria and Print Albert, the musician Handel, the politician Charles James Fox. Georgiana’s son, the Bachelor Duke (he never married, despite being one of the richest and most eligible men in England at the time), bought an adjourning estate, and in 1813 a conservatory went up, with a walled garden at the back and an Italian garden in the front. His menagerie included an elephant, elks, emus, kangaroos and an Indian bull. The conservatory housed England’s earliest collection of camellias. After his death the family rented the estate to a number of tenants, who included the Prince of Wales in 1870s. Between 1892 and 1928 it became the Chiswick Asylum for wealthy patients. In 1929 Chiswick House was sold to Middlesex County Council, who raised funds by public subscription – among the subscribers was King George V. It became a view station during World War II and suffered bomb damage, resulting with a couple of wings having to be removed in the 1950s. It is now managed by the Chiswick House and Gardens Trust, formed in 2005 by Hounslow Council and English Heritage, and is an excellent day out experience for the whole family. In late 1930s an intelligent and gentle lady looked out of the window of her cosy sitting room over the estate that she owned. Her name was Edith May Pretty. He came from a wealthy family of a rich industrialist, who devoted his ample spare cash to educating his two daughters by taking them on around the world trips, with particular interest in ancient artefacts. While her younger sister got married, Edith remained with her parents and continued travelling until her father died. She was 42 when she married a man who had been in love with her since she was 18, and they bought Sutton Hoo, a large estate in Suffolk with a beautiful house on a hill, overlooking the river Deben. The happy couple had a son, but soon her husband died, and Edith devoted herself to charitable work and her young boy, – and spiritual healing, which was a popular fad at the time. She heard stories of ghosts of warriors marching atop those hills. She also knew that they had been plundered hundreds of years previously, with some metal nails found, and she wondered if there was more to them than just spiritual apparitions. Edith organised – and paid for – an archaeological dig, by a local archaeologist Basil Brown, who was recommended to her by the Ipswich Museum. This is his workshop, reconstructed in a little building next to Edith’s manor house. 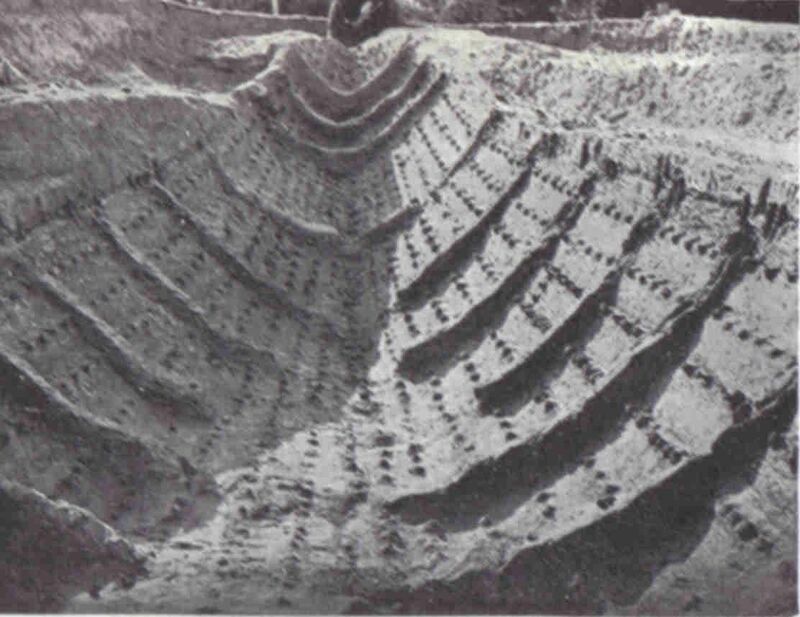 A smaller mound excavated in 1938 revealed a ship burial, previously dug up by 19th century, yielding some ship rivets. Now this one, known as Mound 2, is built up to its original height. In fact, all mounds had been ransacked, as became apparent during excavations later, some as early as 16th century. The works returned in 1939, when Edith insisted that the biggest, Mound 1, was to be dug up. And this is what they found – a ghostly imprint of a ship in the sandy soil. The ship was filled with belongings of an Anglo-Saxon king. Quite soon it became apparent that this is one of the biggest Anglo-Saxon finds in England. Dignitaries from the British Museum told Basil Brown to ‘move over’ – Edith insisted on his involvement and ensured that his job was secure, – this is the kind of woman she was. What they found was a real treasure – in terms of both material and historic value. The 18 mounds sitting close together on one plot of land turned out to contain two ship burials (out of only 3 known in England), 6 cremation burials, a burial in a (possible) coffin and a burial of a young warrior and his horse. Some artefacts are in Ipswich museum and in the visitor centre at Sutton Hoo, but the whole of the most important ship burial in Mound 1- thought to be of Anglo-Saxon king Raedwald – is in the British Museum. This was the generous gift of Edith Pretty – the courts established that everything belonged to her, and she donated the treasure to the nation, with the provision that it will be displayed in the British Museum. This was the most valuable gift made to the British Museum in the lifetime of the owner. Sadly, Edit did not live to see her gift on display. She died in 1942. It was lucky that Mount 1 was excavated in summer 1939 – the First World War starting in autumn 1939, and the estate was commandered by the military, with the house being used as, and the fields as a training ground for military vehicles. During the war the Sutton Hoo hoard was stored in Aldwych Tube Station and now form the main part of the British Museum’s Anglo-Saxon gallery. After the war the estate Edith’s son sold the estate, which became a farm. Edith’s will stipulated that the estate can be sold only on condition that the excavation rights belong to the family, who subsequently passed them to the British Museum. After the death of the last owner in 1990s, Sutton Hoo became a National Trust property, and now offers a 1930s interiors reconstruction in the manor house, a visitor centre telling the history of Sutton Hoo finds, and, of course, a walk around the mounds, which brings us closer to the great mystery of the Dark Age Anglo-Saxons.